Today’s show is an hour-long special interview with the world-famous British musician Roger Waters, founding member of the iconic rock band Pink Floyd. In recent years, he has become one of the most prominent musicians supporting BDS, the Boycott, Divestment and Sanctions movement. Today’s show is an hour-long special interview with the world-famous British musician Roger Waters, founding member of the iconic rock band Pink Floyd. In recent years, he has become one of the most prominent musicians supporting BDS, the Boycott, Divestment and Sanctions movement targeting Israel over its treatment of Palestinians. Waters is scheduled to play Friday and Saturday in Long Island, despite attempts by Nassau County officials to shut down the concerts citing a local anti-BDS bill. 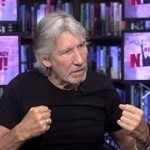 Despite this, Roger Waters has continued to speak out. Last week, he wrote a piece in The New York Times titled “Congress Shouldn’t Silence Human Rights Advocates.” In the op-ed, he criticized a bill being considered in the Senate to silence supporters of BDS. Roger Waters, founding member of the iconic rock band Pink Floyd, is the narrator of a recent documentary titled “The Occupation of the American Mind: Israel’s Public Relations War in the United States.” We air clips from the film and speak to Roger Waters and Sut Jhally, professor of communication at the University of Massachusetts and founder and executive director of the Media Education Foundation, which produced the documentary. Last week, Roger Waters wrote a piece in The New York Times titled “Congress Shouldn’t Silence Human Rights Advocates.” In the op-ed, Waters criticized a bill being considered in the Senate to silence supporters of the Boycott, Divestment, Sanctions movement against Israel. The bill seeks to criminalize individuals who participate in the BDS effort. Waters and Sut Jhally of the Media Education Foundation also discuss criticism of the BDS movement and ask Waters about his public spat with Radiohead’s Thom Yorke, whose band has rejected calls to join BDS.